New Delhi: Over 380 police personnel including from central police forces such as the BSF have been killed while on duty in the last one year, the head of India's top domestic intelligence service said today. Fifty-six out of a total of 383 police personnel who were killed in the last one year were from the Border Security Force, while 42 were from Jammu and Kashmir, Director of Intelligence Bureau Rajiv Jain said today on the Police Commemoration Day. 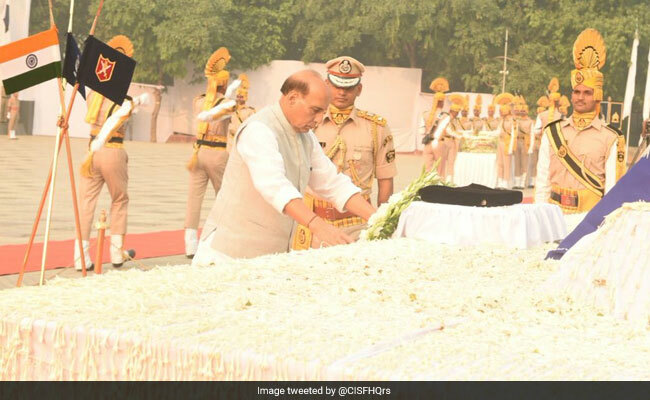 Home Minister Rajnath Singh, under whose ministry the central police forces operate, paid tribute to those who were killed while on duty across the country between September 2016 and August 2017. Seventy-six police personnel were from Uttar Pradesh Police, 49 from the Central Reserve Police Force (CRPF), 23 from Chhattisgarh, 16 from West Bengal, 13 each from Delhi and the Central Industrial Security Force (CISF), 12 each from Bihar and Karnataka and 11 from the Indo-Tibetan Border Police (ITBP). Most of the police personnel were killed while dealing with cross-border firing from Pakistan, fighting terrorists in Jammu and Kashmir and Naxals. The Police Commemoration Day is observed in memory of 10 policemen who died in firing by Chinese troops in 1959 when they were defending India's border with China, the Home Ministry said in a statement. The police personnel were responsible for securing India's border with Tibet until the autumn of 1959. On October 20, 1959, three reconnaissance patrols were launched in northeastern Ladakh to make way for further movement of an Indian expedition, which was on its way to Lanak La. While members of two parties, the third one comprising two police constables and a porter did not, the statement said. More forces were mobilised the next morning in search of the missing personnel. A patrol of some 20 personnel led by Karam Singh, Deputy Central Intelligence Officer-rank officer, went on horseback while others followed on foot in three sections. At mid-day, Chinese Army personnel were seen on a hillock, who opened fire and threw grenades at the Indian patrol, the statement said. Since there was no cover, most personnel were injured. The annual conference of Inspectors General of Police of States and Union Territories held in January 1960 decided that October 21 would be observed as Commemoration Day at all police lines in the country. Since independence, 34,418 police personnel have died while on duty, the Home Ministry said in the statement.